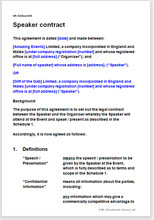 This is a comprehensive contract that can be easily edited to protect the interests of either the event organiser or the speaker or presenter. Internal business events, such as employee training "away days"
As well as the main contractual terms, such as fees and expenses and cancellation, this document covers many practical matters, such as provision of equipment, and includes other legal provisions, such as confidentiality and ownership of intellectual property created by the presentation (for example when the event is recorded), to give you a strong base for a deal. "I was recommended to you some time ago - many thanks for an excellent document. I have you in my favourites Easy to navigate website - clearly displayed and simple to understand. Very easy to use and edit document in clear English. It has enabled me to present a professional and relevant document to my customers with ease. I will recommend Net Lawman due to easy to use website, documents in clear English and easy to edit, very reasonable and prompt."